So who are they? Part of the international Climate Action Justice network, but the group currently blocking the Coryton refinery are probably just an affiliated bunch. 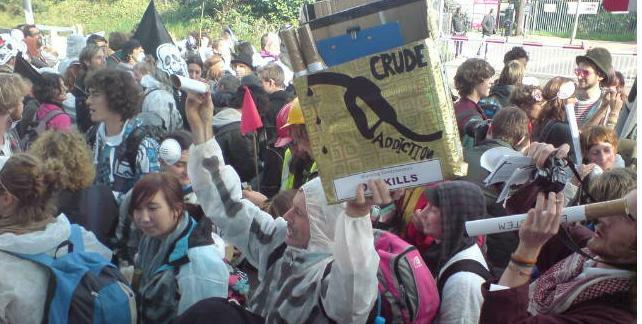 This idea is nothing new – people have been organising high-profile protests against oil dependency for some time. But what is “oil dependency”? Basically, it’s the tendency of politicians to favour the oil industry against all common sense. One obvious example of this is the motor industry, which enjoys protected status in order to furnish votes. Look what happened when the economy crashed in 2008 – subsidies to the motor industry to “protect jobs”. If Gordon Brown and friends were simply interested in finding employment for redundant motor industry workers they’d have spent the money on building something useful, like cycle lanes or wind turbines. But no – bail out the motor industry as people like cars, and hope no one notices how hypocritical this sounds from a New Labour twittering on about the environment while using it as an excuse to raise taxes. Other high-profile groups involved in this kind of thing are Plane Stupid and Climate Camp , although this lot are clearly more confrontational about it. If you want the other extreme there’s the World Naked Bike Ride. These are all groups who have woken up to what “Oil Dependency” really means – pollution, congestion, war, greenhouse gasses and political dodgy dealing to secure supply. Would certain countries get away with what they’re doing if they didn’t the off-button the oil supply? As yet, however, none of these are a political force to be reckoned with. Blocking an oil refinery will get the issue in the news, if they handle things properly, but will David Cameron sit up and take notice? So good luck to Terri Orchard and her merry bunch (not all-women as reported in the press). From what I understand, Coryton is only the first refinery on the list, and they’re planning to cover a lot more if they can. If this proves correct, I’ll be glad I ride a bike. Anyone outraged that News of the Screws journalists have been “hacking” in to mobile ‘phones needs to get a grip on reality. They’re investigative tabloid journalists; what do you expect them to be doing? To call it “hacking” is grossly overstating the case anyway – what they did required no technical knowledge other that that available in any playground in the country. All you need to do to retrieve people’s voice mail messages is dial their number, and when you get through to voice mail, enter the PIN. Most people leave the PIN as the system default. You might argue that this is a gross breach of privacy and so forth. But it’s no more so than camping out on someone’s doorstep to see who goes in and out, following them, or tricking them into telling you something they wouldn’t if they knew your were a journalist. New Labour was very keen to suppress the traditional liberties of the population in general and passed various dodgy laws to protect the lives of the guilty from prying journalists. In 2000, listening to other people’s voice mail was made a specific offence. “And quite right too!”. Wrong! It’s just another example of those in power making it difficult for us to check up on what they’re doing. We have (or had) a free press with a tradition of snooping on politicians, criminals and anyone else they wanted to using whatever means, as long as it was “In the public interest”. Journalists are also out to sell papers, so the “public interest” defence is often strained to its limit, or broken. However, it should remain as a defence in a court of law and people should be able to argue their case there. It should be all about intent. But New Labour had other ideas. People are uneasy about voice mail because it’s technological, so lets look at another example. Suppose a journalist was camped outside someone’s house, noting down who came in and out. Another invasion of privacy, but right or wrong? Well that depends – if it’s some innocent person then the journalist will probably end up throwing the notes away, so no harm done. If someone uses information collected in this way in the pursuance of a crime (e.g. Blackmail), that’s another matter, but journalists don’t do that. Now supposing the journalist is investigating a suspected terrorist, and checking up to see who they’re associating with – or even a politician associating with a known crook. Clearly this information in the public interest. As to the current difficulties – anyone who knows anything about the press will tell you that these and many other tricks are employed as a matter of course, although journalists won’t make a big noise about using them. It’s conceivable that an editor like Andy Coulson would neither know nor care exactly what his investigation teams were doing to come up with the information; you don’t ask. It’s also inconceivable that only the hacks on the News of the World had thought of it. Sources need protection. It’s clearly a political stunt by old new Labour. Could they be upset that the press, including Mr Coulson’s old rag, turned against them? They used to be friends with the News of the World. At the time of the original scandal, it appears that the first politician to call Andy Coulson to commiserate with him about having to resign was none other than Gordon Brown. Apparently he went on to suggest that someone with his talent would soon find another job where he could make himself useful. (Source: Nick Clegg at today’s PMQs). So, the Government/Bank of England lent £61,000,000,000 to prop up the Scottish banks last year and didn’t think we should know about it. It didn’t appear with any clarity in the accounts, and I’ve just been listening to “Lord” Myners, Gordon Brown’s “Treasury Minister” defending this on Today, saying that “…no retail bank customers lost out.” So that’s alright then? As usual, he was let off lightly. The Bank of England is publishing cooked books, and the justification is that it’s for the greater good. What I’d like to know is: what’s the point of publishing accounts if they’re deliberately misleading? Or more accurately, dishonest. The government seems to think it’s okay to lie to us whenever it feels that we’re better off not knowing something. And you can hardly call £61,000,000,000 a trivial issue that’s easily overlooked by mistake, can you? Well perhaps it is to Gordon Brown and his banking mates. No wonder they fail to see any problems with their expense claims. According to Myners, the board of Lloyds was made aware of the loan at the time they were merging with HBOS in those murky circumstances. So what? Lloyd’s isn’t owned by the board – the Lloyds shareholders had every right to know, but they decided to keep quiet about it. They were tricked into voting for a merger with a bank that was only propped up by a massive secret loan. Paul Myners is, of course, a New Labour Lord, given a peerage by Gordon Brown after donating £12,700 towards his leadership campaign in 2008. He hasn’t been elected by anyone other than the Labour Leadership. The fundamental issue here is that if any company published cooked books, concealing a £61,000,000,000 transaction, they’d have the serious fraud office all over them – and rightly so. This government, on the other hand, thinks it knows best and will only tell us what it thinks we should know. Sounds familiar? Of course, plenty of people must have known about it and kept quiet. So why has the news come out now? Presumably someone was about to spill the beans and they’ve published as the least-worst option. As we all know, the Queen’s Speech yesterday was written by Gordon Brown and contained a fantastic list of things he’d do should the British public ever elect him as Prime Minister. While everyone was falling about laughing at the idea of new laws to make both budget deficits child poverty illegal, you might have missed some gems from Digital Economy Bill, which was announced today and will be published tomorrow (Friday). The actual bill appears to include such ideas as the £6/year tax on all land telephone lines (why not mobiles?) to ensure that everyone in Britain can get 2Mbps broadband by 2012. Do these politicians understand what the term ‘broadband’ means? Why should we be subsidising the infrastructure for ISPs who’ll be charging us whatever the like for the use of the new network we’ll be paying for in this extra tax. Perhaps the biggest ‘idea’ is a clampdown on Internet based piracy. New Labour’s sleazy spin-doctor Peter Mandelson was on about this recently, and it’s going to be in the bill. Apparently persistent offenders will get a series of stiff letters and the ISP will eventually pull the plug on them. Get real! Anyone with the slightest idea how the Internet works knows that you can’t tell whether material transiting a network is subject to copyright. You can’t even tell what it is! No amount of legislation will change that. On the same tack, children are going to be protected by making it illegal for video game retailers to sell games intended for over 12’s to under 12’s. That’s really going to work. The government can’t keep hard drugs out of a prison, so how are they going to stop anyone getting hold of dubious video games. Another nice little earner for the treasury is switching over to digital radio by 2015. If you thought updating to digital TV was bad, they now want you to scrap all your radios too. Including those in cars? DAB radios use 20 times the power of simple FM receivers – not exactly a green idea either. I do hope that whoever wins the election next year will ditch these stupid ideas, but do the conservatives have any better idea about what the Internet really is?